This month’s pope is St. Clement of Rome, here to console all of you who saw St. Clement of Alexandria as Saint of the Week and were disappointed that he was not your man. According to tradition, there are two Bishops of Rome between St. Peter and St. Clement, and their names are Linus and Anencletus. 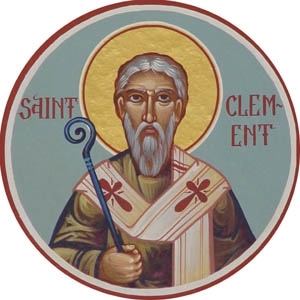 St. Clement was a/the leader of the Church in Rome AD 96, and is most famous for his letter 1 Clement, a sermon attributed to him and transmitted as the letter 2 Clement, and a set of works falsely written under his name, ‘The Clementines’. He is also famous for having the Roman name ‘Clemens’, because in Philippians 4:13 St. Paul makes mention of someone with such a name, and because the consul Flavius Clemens was executed by Domitian for ‘atheism and Jewish customs’ which sounds a lot like first-century circumlocutions for Christianity. Were these two figures related to our St. Clement, Bishop of Rome? Who knows? Can we ever know? Not for certain; not with first-century prosopography of little-known Christians. We can’t really know anything else about him for certain. The Liber Pontificalis says he consecrated some bishops and ordained some priests and deacons, but that presupposes a Late Antique/Early Mediaeval organisation for the fledgling Roman Church. As we explored last month with St. Peter, the episcopacy, let alone papacy, was still developing in this period after the Apostles — the Church’s natural leaders — died. Indeed, that the episcopate was still a concept under development is amply demonstrated by the fact that the letter we attribute to this man is addressed from the Church at Rome to the Church at Corinth, not from Clement. Corinth seems to have been ruled by a body of presbyteroi whom restless young men had ejected, establishing their own authority instead (today they just go found their own churches instead). Nevertheless, the Eastern Orthodox Andrew Louth sees no reason to doubt that Clement wrote the text (see the Penguin classics Early Christian Writings), while the Baptist D H Williams sees Clement as an authority figure, a pastor, but the letter as a communal effort (see Retrieving the Tradition and Renewing Evangelicalism). Holmes, in the most recent edition/translation of Lightfoot’s edition/translation ofThe Apostolic Fathers, says that the letter displays a unity of style and thought that points to a single author, although it is meant to represent the entire community at Rome. I’ve a feeling Williams would agree. As noted above, the Corinthian church has fallen into a state of turmoil, with young upstarts supplanting the church body’s leading elders. Clement calls them to harmony and obedience. The call to obedience at first strikes you as the sort of thing you’ll grow accustomed to in reading papal correspondence. However, the call to harmony seems stronger. Clement calls the Corinthians to not simply be obedient to those in ecclesial authority, but to display kindliness to one another. The obedience is there to serve the homonoia of the Christian community. One is reminded of the many calls throughout the New Testament to be self-sacrificing, mutually submissive, the servant(s) of all, and full of love. Clement makes his case for harmony through Scripture — i.e. the Septuagint (Greek Old Testament most common in ancient Church) — as he piles up biblical quotation and references one upon the other. He turns to the history of the Church, discussing the recent martyrs as well as Sts. Peter and Paul. And then he gives us classical examples. I shall perhaps remark on the Phoenix and the world of wonders possessed by the ancient and mediaeval mind later. Someday I wish to do deeper research into the relationship between the Fathers and pagan mythology; we spend a lot of time looking at philosophy, but what of these stories which are officially condemned but often, when taken by the Fathers as actual history or natural knowledge, slip their way into their texts? What counted as ‘myth’ to an ancient mind, anyway? I digress. Besides the fact that we associate the Phoenix with Greek myth, I enjoy its presence here. Clement sees typology and the wisdom of God everywhere, not simply in the Scriptures. All of God’s creation points us to Christ. Let us bow down in worship. I have little else to say of St. Clement of Rome. May you be encouraged by the writings of this early Church leader, a man who walked the streets of Rome in the age of the Apostles. ← Happy Feast of St. John Cassian!